Here you can find the most commonly asked questions regarding O&O Syspectr. Should you not find the answer to your particular question here, then please contact us. We are always happy to help! If you forget your password, you can have a new (temporary) one sent to your email address. Enter your E-mail here and confirm the resetting of your password. You must then login using the new password you created. Should you wish to change the e-mail address assigned to your account, please send us a message from within your O&O Syspectr account. We will then contact you to go through the next steps. Can I allow another person to access my account? Yes, you can allow another O&O Syspectr user to access your account provided that you are using. You have the option of giving another user read-only or writing permissions to your account. Read-only permissions will allow another user to see your data but not change any settings. If you wish to allow this, give the user writing permissions. This can be very useful when an external IT consultant is called in to help resolve a problem. These permissions can be canceled whenever you wish. How do I activate/deactivate two factor authentication for my account? Two factor authentication protects your account against unauthorized access. In addition to your user name and password, a second factor is required in order to confirm your identity to the system. This will require your installing a so-called “Authenticator” app on your mobile phone that will be connected to your account. Whenever requested, you’ll be able to see this code in the app and then enter it. These apps are available for all mobile telephones and implement the so-called “Time-Based One-Time Password Algorithm”, that was defined by the Internet Engineering Task Force (IETF) in RFC 6238. Log in to your O&O-Syspectr account at app.syspectr.com. Go to “My Account” located under your profile name, top right in the navigation bar. Select “Two factor authentication” and then click on “Activate”. You will now receive a Transaction Authentication Number (TAN) sent to the email address connected to your account. Enter this TAN and then click on “Next”. You are then led to activation by way of a QR Code for use through your Authenticator App. You will then be asked enter the confirmation code from your App to complete the process. Once you have completed the process you are presented with a one-off “Emergency code”. Please write this down and keep it safe! This can help you deactivate the two factor authentication should you lose your phone or have a problem with your Authenticator App. Select “Two factor authentication” and then click on “Dectivate”. Enter this TAN and then click on “Next” to deactivate. After you have entered your user name and password you will be prompted to enter a security code from your Authenticator App. Now enter your one-off “Emergency code” to deactivate two factor authentication. The two factor authentication is now deactivated. You can activate it again at any time by following the instructions above. What can O&O Syspectr do? This requires the O&O Syspectr Client software being installed one time only on the computer. After this, the software is updated automatically. An easy to use web app allows you to use the software on any browser and device (even on smartphones or tablets). We’re currently at work on integrating additional modules into O&O Syspectr. That’s why we’ll be very grateful for any feedback and suggestions you might have. How can O&O Syspectr be installed? Your O&O-Syspectr account can be created during installation or even beforehand. You’ll then be able to manage your computers in any web browser. Which operating systems are supported by O&O Syspectr? O&O Syspectr can be used on any Windows system starting from Windows 7 and Windows 2008 Server (R1). Microsoft .NET 4.0 Framework, is required. This is available free of charge and can be installed automatically if not already in use. Administrative permissions are required for installation. There are no special hardware requirements so O&O Syspectr can be installed on any system running the Windows versions mentioned above. O&O Syspectr also supports virtual machines such as Microsoft Hyper-V, vmware, Microsoft VPC and Oracle VirtualBox. You can access https://app.syspectr.com/ with any browser on any device (PC, smartphone, Tablet) that has access to the internet. To login, use your Email address and the password you created. What are the modules in O&O Syspectr? Modules combine types of information or features. O&O Syspectr already contains a number of modules that provide information about the computer’s status quickly and easily. These modules also allow for partial control of the various components. Typical modules are Software, Hard Disk Drives, Remote Desktop, etc. According to the license, there are different modules available. There are also premium modules available that provide additional or advanced features in exchange for a modest fee. These modules can be ordered as needed. How do I enable or disable a module? Modules can also be deactivated if you wish so that the associated system information is no longer requested or the appropriate function is made unavailable. To activate or deactivate a module simply select the appropriate computer, click on the settings symbol (a cog wheel positioned top right over Computer Information). The settings page displays all available modules which can be turned on or off using the slide control. Is data transmission from O&O Syspectr secure? Yes. data transmission between the O&O-Syspectr Client and our servers is done using SSL encryption so that there’s no possibility of unauthorized access to any data. We also use additional methods to protect communication. Where is data from O&O Syspectr saved? What data does O&O Syspectr store? O&O Syspectr saves system information in order to display the current status of a computer and provide a diagnosis for possible problems. It does not save any personal files, documents, or graphic data. When using the Remote Desktop, image data will be transferred to our server encrypted and saved only for the duration of transmission. There is never any permanent storage of image data. How can I register with O&O Syspectr? Registration for O&O Syspectr requires only a valid Email address. Once you provide it, you’ll be sent a confirmation and must then create a password. You’ll then be able to download the O&O-Syspectr-Clients installation and add as many computers as you’d like to your account. Register here. Registration is free of charge and without any obligations. How can I turn notifications on and off? Sign in to your O&O Syspectr account and click top right on your account name. Select from the list “Notifications” and this takes you to your individual notification settings. 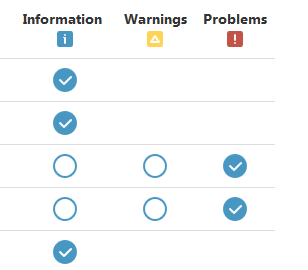 You can select per module whether to be notified of problems only or also warnings and information. Simply click on the appropriate check box next to the various modules to either activate the notification or to turn it off. Not every module has all types of events (Information, Warnings, Problems) so the selection can on occasion be limited. All notifications are also logged and saved so you can check them there as well as in your notification e-mails. How do I uninstall O&O Syspectr from a computer? O&O Syspectr can be uninstalled via the Windows Control Panel just like any other Windows program. The computer will, however, remain in the your O&O Syspectr account chronology just in case you wish at some point to access the historical data of that (no longer connected) computer. You are, of course, also free to simply delete the computer entirely from your account using the product menu if this is an option you don’t wish to have. How can I to deploy O&O Syspectr using Group Policies? Our customers have a very easy way to roll out O&O Syspectr on all company computers. To do this we provide a personalized MSI file in your account that can then be installed on all systems using group policies. You can find a complete description of how this works on the page “How to deploy O&O Syspectr using Group Policies”. How can I use PowerShell script on multiple computers simultaneously? Select a computer in your account that enabled the PowerShell module. Click the PowerShell module there and switch to the Script Library (above right button). In the Library, select the script you want to use on the computer. This will bring you into editing mode. Below right you’ll see a button “Add computer”. Click it. In the following menu, you can select the computer you want by choosing individual ones (holding the Ctrl key) or entire sections (holding the Shift key). The script will then be added to all the computers and run immediately. You can also set up a schedule for running the script if so desired. To do this select another option in the Execution listbox. How does PowerShell work in O&O Syspectr? Actually, PowerShell works in O&O Syspectr just as if you were working directly on the computer. In addition, O&O Syspectr offers the evaluation of the outcome of the PowerShell script and scheduling, as you may know from Linux crontab . This makes it possible to execute PowerShell scripts at specific times, without having to use the Windows Task Scheduler. With the help of the PowerShell scripting module, you are no longer bound to the restrictions of popular IT monitoring solutions. It is finally possible to customize and extend your wishes according to your IT monitoring! Which PowerShell versions are compatible with O&O Syspectr? How to create and manage PowerShell scripts in O&O Syspectr? How to evaluate the results of PowerShell scripts? How to execute and schedule PowerShell scripts? Which versions of O&O Defrag are supported? O&O Syspectr supports all current versions of O&O Defrag starting from version 18 till version 21 (current version). Does O&O Defrag need to be installed locally on the target computer? Yes, O&O Defrag must be installed in order to be used with O&O Syspectr. Installation will be carried out automatically by O&O Syspectr whenever a local version is not already installed. If there’s an older version of the product in place that O&O Syspectr does not support, you’ll receive a notice and will either have to remove the older version or upgrade to the current one. The integrated Remote Desktop in O&O Syspectr can be used for doing this, providing you have this module available. Does Avira have to be installed locally on the target computer? Yes, Avira must be installed on the target machine to be managed by O&O Syspectr. The installation can be made over O&O Syspectr, providing no version is already installed locally. How do I install Avira on the desired target computer? The target computer must first be managed by O&O Syspectr. Go to the symbol of the desired target computer in O&O Syspectr, click on the Avira module and follow the instructions there. How do I start a scan with Avira? Call up the desired target computer in O&O Syspectr, click on the Avira module and start a quick scan on the computer with a click on “Quick system check”. By clicking on the “New Scan” button you can create a new regular scan task. Where can I find my Avira license number (OTC)? You can find the Avira license number that has already been assigned to a target computer in O&O Syspectr in the Avira module under “Settings” (gear symbol). You can find your license numbers (OTC) purchased from Avira in the purchase confirmation email that you received directly from Avira or in the documents of your Avira partner. For questions about the Avira license numbers (OTC), please contact Avira directly: support@avira.com, https://www.avira.com/support, Tel . : 00800 2444 6444 (D-A-CH). If you have any questions about the Avira products (scan engine, licensing, etc. ), please contact Avira Operations GmbH & Co. KG directly: support@avira.com, https://www.avira.com/en/support , Tel . : 00800 2444 6444 (DA-CH) or +49 7542 500 44 11 (all other countries).